The Chimes, which had a workshop production at Orlando Shakespeare Theater in January 2009 and its New York premiere later that year, brings to mind an entire canon of other private-school dramas, from A Separate Peace and The Prime of Miss Jean Brodie to Dead Poets Society and The History Boys. But Snipes makes even familiar themes resonate with his audiences, and UCF Conservatory Theatre’s capable production brings their problems home. Snipes, who graduated from Stetson University in 2000, sets his story in 1939 at the fictional Barrington School, where a transfer student named Nick Ross is spending a lonely first night. Soon enough he’s adopted by a trio of fellow students – the fey, egotistical Vivian Porter; the heavyset, slightly dim Birdie McAllister; and their fearless leader, self-confident Marcus Hale. These boys are the Chimes, a clique dedicated to Shakespeare and to various late-night shenanigans, and Nick makes himself welcome by proving also to be a Shakespeare devotee. That may be an unlikely coincidence, and a couple of others turn up as the boys immerse themselves in a production of The Merchant of Venice – and then discover that their headmaster, Mr. Barrow, has no interest in their exploring the humanity of Shylock, the play-within-a-play’s Jewish moneylender. But a couple of far-fetched minor plot points matter very little as Nick and Marcus find themselves butting heads with Barrow – and as they discover other yearnings that set them apart. At UCF, director David Lee underscores the vivacity of those young men: They rarely walk onto the stage when they can burst onto it like half-grown colts. The four actors playing the teenagers (Ian Kramer, Zachary Layner, Kevin Alonso and Robert Aronowitz) bring rambunctious life to their roles, and their vividness stands in marked contrast to the deliberate colorlessness of the actors who play middle-aged versions of two of the students: Bob Dolan as Birdie, who has become a shambling drunk, and Mark Brotherton as Nick, who has turned into a despairing ghost of a man. Tom Nowicki, genial and mild-mannered with just a touch of menace, nicely underplays the nastiness of the headmaster, and Trevin Cooper is very funny as a fussy, eager-to-please drama teacher. It’s those adults, of course, who bring the ills of the world into the boys’ sheltered lives – and who make it clear, as the playwright has said, that prejudice is something that has to be taught. But it’s the boys themselves who make that knowledge hurt and who suffer from the consequences. And it’s the younger actors – Kramer as the isolated, thoughtful Nick; Alonso as the exuberant Viv; Aronowitz as the plodding Birdie and Layner as the high-minded Marcus – who find the sweetness in their youth and underscore the sad fates of their older selves. 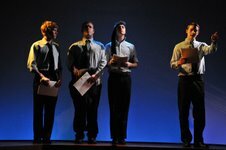 The stage lights may turn golden on the four young men in The Chimes’ last scene, but a stronger light shines within them. Blame the ravages of the world for switching that light off. What: UCF Conservatory Theatre production of Kevin Christopher Snipes drama. Where: Black Box Theatre, University Theatre building, University of Central Florida, Alafaya Trail at University Boulevard, Orlando. When: 8 p.m. Sept. 24 and 25 and Oct. 5 and 8, 2 p.m. Oct. 10 (in repertory with Paula Vogel’s How I Learned to Drive). Cost: $17 general, $15 seniors, $10 students. Photo, top left: Ian Kramer, Robert Aronowitz, Kevin Alonso and Zachary Layner. Bottom left: Zachary Layner and Ian Kramer. 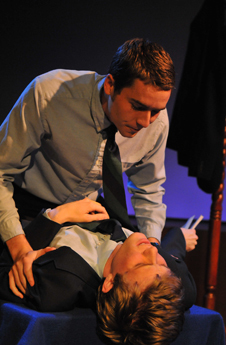 Photos courtesy of UCF Conservatory Theatre. This entry was posted in College and university theater, Orlando theater, Reviews and tagged david lee, Kevin Christopher Snipes, The chimes, ucf conservatory theatre. Bookmark the permalink. What a lovely summation. Thank you for writing intelligent cogent reviews. They are always a pleasure to read.